"General relativity says gravity should be working in three dimensions, and [the results] show that that's what we see," said Kris Pardo, lead author on the study and a doctoral student at Princeton University. While general relativity has proven so far to be spot-on in describing our universe, there's one thing it can't explain very well: why our universe's expansion is accelerating. 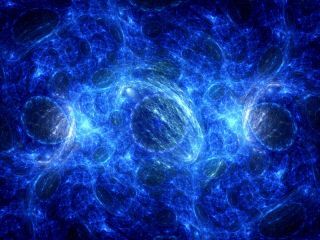 Scientists nicknamed the cause for this acceleration "dark energy," but no one knows what it is. Some theories modify gravity to explain the expansion, suggesting gravity works differently on large scales. Many of these ideas predict that other dimensions exist, and these could be probed by gravitational waves. "This whole effort of looking for modified theories of gravity is in essence driven by the dark energy mystery. We're trying to find: Is there a way that we can tweak the laws of gravity to explain why the universe's expansion is speeding up?" said Tessa Baker, a cosmologist at Oxford University in England who was not involved in the study. According to many of these theories, if extra dimensions do exist, gravitational waves would "leak" into those dimensions, causing the waves to weaken as they made their way across the universe. The scientists in the recent study measured how far the gravitational waves and the light waves from GW170817 traveled to reach Earth, but the researchers didn't find any hints of the weakening that would be associated with extra dimensions. The GW170817 collision event "was very, very local in cosmological terms — basically on our doorstep," Baker said. But physicists would really like to see more events at greater distances (which would have occurred further back in time), because those would reveal if gravity or dark energy have changed over time, Baker added. For now, the universe appears to have only those dimensions we're used to. But don't despair, science fiction writers and time-travel aficionados — smaller, compact dimensions may still be out there.